You might not believe me. But there is a down side to following your dream. Well at least when that dream revolves around writing, reading, talking, thinking, photographing AND cooking food. Yes being surrounded by delicious things is brilliant on one hand. But it also means a lot of opportunities to overindulge. I hate it when I’ve had a big day in the kitchen ‘tasting’ this and ‘picking’ at that and I sit down to dinner and just don’t feel hungry any more. As my Irishman says, ‘hunger is a tasty sauce’. I always feel like I’m missing out when that particular condiment is absent. The good news is I’ve found some simple strategies that help me avoid over eating. And better still, they actually help me enjoy my food more. 1. Sit down at a table. How can you give your food the respect it deserves if you have half your attention on the TV or your Instagram feed? Sitting down at a table and shutting down your devices or other distractions is probably the easiest thing you can do to enjoy your food more and feel more satisfied. While I do sit down for all my meals, I’m definitely not perfect! I have a terrible habit of ‘picking’ at things as I cook. Since I make Fergal sit down to eat his snacks and meals it’s only fair that I lead by example, so am working on it. It’s hard to really savour and enjoy your food if you’re shoveling it down. I’ve found the best way to eat more slowly and really appreciate every bite is to ask myself a simple question when I’m starting to load up my fork. Is there food already in my mouth? If yes, I put down the fork and wait until I’ve finished that mouthful before loading the next. It takes a bit to remember but once you build the habit you’ll be surprised how effective it can be. Don’t worry, I’m not going to tell you to count every bite. Where’s the fun in that? When I feel the urge to swallow, I remind myself to chew just a few more times. Simple and for me really helpful. One of my first real jobs was waitressing at an Indian restaurant. While I was pretty crap at waiting tables, I did develop a deep love for Indian food. One of my all time favourite curries was an intensely green spinach sauce called ‘saag’. It’s amazing with lamb but also great for giving chicken a meaty ‘iron’ rich boost. Although spinach is traditional, I prefer it with the more intense flavour of kale. But any greens are good. It’s one of those dishes where the complex curry flavours satisfy the taste buds and the greens satisfy your body. So good! 1. Heat a little oil in a large pot. Brown chicken, on a medium high heat stirring every few minutes until just cooked through. Remove and place in a clean bowl. 2. Add a little more oil to the pan and toast curry powder on a medium high heat for about 20 seconds. Add the chopped spinach / kale and a splash of water. Cover and cook for 5-10 minutes until the greens are wilted down. Check and stir every few minutes and if drying out or starting to burn add more water. 3. Remove from heat and add cream. Roughly puree the greens with a stick blender or leave chunky. Taste and season with lots of salt and pepper. If you’d prefer a stronger curry flavour add more curry powder. 4. Return chicken to the pan and heat again until warmed through. Divide between two bowls and top each with a generous dollop of yoghurt and a drizzle of chilli oil (if using). carb lovers / more substantial – serve with steamed rice, warm naan bread, or steamed potatoes. Or knock yourself out and go with all three! dairy-free – use coconut cream. vegetarian – It’s brilliant with the Indian cheese paneer (just crumble through at the end). I’ve tried it with home made paneer and it was amazeballs, if a little time consuming. Or pan fry some halloumi and serve with. I imagine saag chickpeas or lentils would be amazing. My Irishman loves it with a handful of roasted cashews on top. no chilli oil – use dried chilli flakes or powder or chopped fresh chilli for some visual interest and extra heat. mild / little person-friendly – use garam masala instead of curry and skip the chilli oil. Yes! Make the curry as per the recipe but don’t add yoghurt. Refrigerate for up to a week or freeze for months. To serve bring back to a simmer and serve with yoghurt and chilli oil (if using). Excellent reminders! And I love the saying that your Irishman provided. I know that I’ll think of it before taking a nibble during prep and cook time. Really enjoy your recipes and thoughtful words. Thank you from Ohio! Lovely to hear from Ohio! 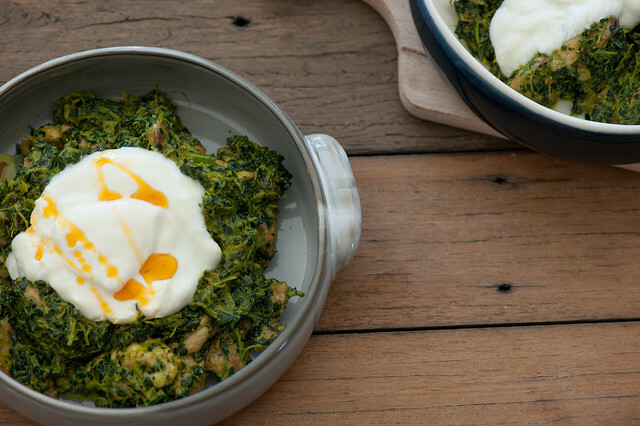 The saag chicken sounds amazing! Do you think it will work with frozen spinach? Absolutely Alka! 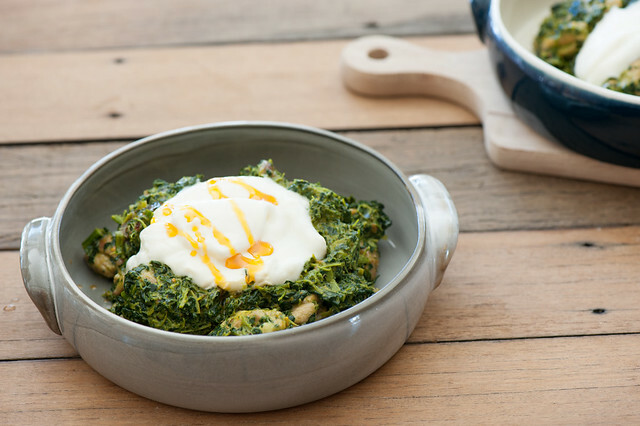 Frozen spinach is perfect in things like this – just cook enough to warm through. I am guilty of the second rule,try eating slowly,hehehe…..